Members are invited to learn about the Remodelers Council's Universal Living certification program and receive training to be a program verifier. Verifiers work with builders and remodelers in the planning and construction phases of their projects and check to see that program criteria are met. Download the latest program checklist and learn more about the program at this webpage. 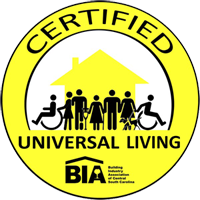 Also, the local Universal Design Consortium Group will meet at the BIA Office prior to this training session. You are invited to attend if you like. That meeting will start at 1:00 p.m. and conclude before we start training at 3:00 p.m. E-mail me if you'd like to attend.